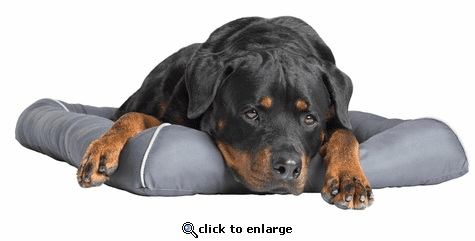 Engineered with the CoolPhase\xBB gel cell technology, this unique pet bed absorbs and dissipates excess body heat, indulging your pet\xCDs natural instinct to find a cool spot for rest and rejuvenation. Our story starts with a dog. When our black lab Skylar was a puppy, my daughter turned to me and said, 'Look, Dad, it\xCDs like he\xCDs hugging me with his eyes. 'As Skylar (and my kids) grew, he continued to melt our hearts with his funny face, wagging tail and sweet nuzzles. Now, he\xCDs our furry Buddha _ unconditionally loving, totally non-judgmental and always living in the present moment. Skylar has given us so much love and laughter through the years, we thought it was time to give him (and every other amazing dog out there) something in return. So we looked around at the latest technology in comfort for humans _ and thought, 'Hey, don\xCDt our dogs deserve this too?' And so began our obsession to create PetTherapeutic comfort pads. Human comfort has always been our inspiration _ if thermal reflective heat is all the rage for keeping people warm, then why shouldn\xCDt dogs benefit from that too? If we sleep on orthopedic, memory foam mattresses, then our dogs deserve that same comfort. Cooling gel mattresses are another innovation for people\x83and now it\xCDs gone to the dogs. We even went so far as to have our brilliant team of engineers develop a therapeutic magnetic pad so our older dogs could rest easy. We confess, every product we developed, we did it out of love. That\xCDs why we say our products are \xF1engineered for comfort, motivated by love.\xEE Pure, crazy, unconditional love for our dogs. You know what we\xCDre talking about.